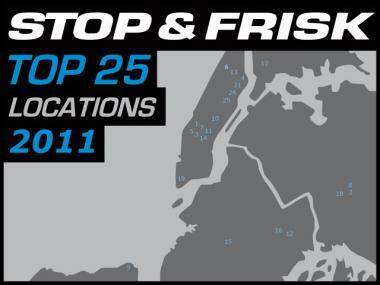 DNAinfo.com New York crunched the NYPD's 2011 stop-and-frisk data to find the top locations broken down by race. TIMES SQUARE — The number of black and Hispanic New Yorkers stopped-and-frisked citywide far outnumbers the number of whites stopped, but an analysis of the NYPD's statistics found that cops stopped more people at the Port Authority Bus Terminal than any other location regardless of race. 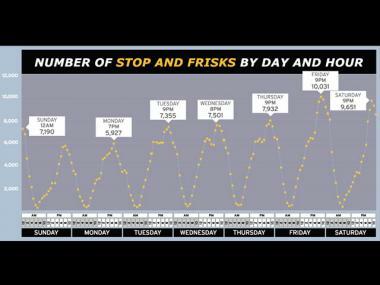 DNAinfo.com New York broke down the city's 2011 stop and frisk numbers by race and found the top 25 street-by-street locations where the NYPD conducts the most stop and frisks — most of which were at high-traffic transit hubs. White New Yorkers are far more likely to be stopped in Manhattan — at the Port Authority, at both Staten Island Ferry terminals, and at several other hot spots in Staten Island, the statistics showed. Black New Yorkers were stopped most frequently at the Parsons/Archer E train stop in Jamaica, Queens, followed by the Port Authority, Penn Station and 125th Street and St. Nicholas Ave.
And Hispanic New Yorkers were stopped most near the 7 train stop at Roosevelt Avenue and 103rd Street in North Corona, followed by the Port Authority and the Roosevelt Ave and 82nd Street 7 train stop. Out of the nearly 700,000 people stopped and frisked citywide, a whopping 1,633 stops were logged at the the corner of West 42nd Street and Eighth Avenue — the most of any location in the city — according to NYPD numbers. But despite stopping an average of 4.5 people a day, police only recovered two guns at the spot last year — a rate of just .12 percent. Fifty-five percent of those stopped at the Port Authority in 2011 were black, 24 percent were Hispanic and 14 percent were white — a number that mirrors the breakdown of citywide stop and frisks, with 53 percent of the nearly 700,000 people stopped in 2011 being black, 34 percent Hispanic and 9 percent white, according to NYPD numbers. Eric Johnson, 30, a black construction worker who lives a block away from the Port Authority, said he has been stopped repeatedly while returning home from work or going out on weekends near his home. “This is what happens here,” said Johnson, who is black, and said he was last stopped May 10 at 10 p.m. on his way home from a bar. He estimated it was the sixth time he’d been stopped so far this year. “It’s crazy,” said Johnson, adding that the experiences have been humiliating, with officers yelling at him, forcing him against the wall, and searching through his things. “They embarrass you. They make you take your shoes off. Everybody’s looking at you," he said. Four of the top 10 spots for overall stops are in Midtown, with 1,108 stops in front of Macy’s at West 34th Street and Seventh Avenue, 1,026 stops at Eighth Avenue and West 34th Street, near Penn Station, and 890 stops at Seventh Avenue and West 42nd Street, another major transit hub. While Midtown's 14th Precinct logs few violent crimes, it leads the city in overall crime, thanks to an extremely high grand larceny rate. Also topping the hot spot list were a trio of intersections in Jamaica, Queens, including the corner of Archer Avenue and Parsons Boulevard, at the end of the 'E' line at Jamaica Center, which came in second with 1,522 stops, Jamaica Avenue and Parsons Boulevard, which logged 837 stops, and Sutphin Boulevard and Archer Avenue, which logged 597. Rounding out the top 10 were Lexington Avenue and East 125th Street in East Harlem, Saint Nicholas Avenue and West 125th Street in West Harlem, the Staten Island Ferry Terminal, and Lexington Avenue and East 59th Street, another major transit center on the Upper East Side. Other unexpected spots with a high number of stops included Lexington Avenue and East 86th Street on the low-crime Upper East Side, Lexington Avenue and East 42nd Street, outside of Grand Central Terminal, and Fulton and Church Street Downtown. 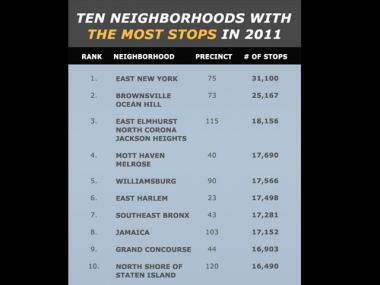 An NYPD spokesman did not respond to requests for comment about the hot spot findings, which differ significantly from neighborhoods where overall stops are high, such as East New York, Brownsville and Jackson Heights, which logged more than 74,000 stops in 2011 combined. But Police Commissioner Ray Kelly and Mayor Michael Bloomberg have repeatedly credited the stops for what is on track to be the city's lowest murder rate on record, and have warned that rolling back the program could re-open the door to the mayhem of decades past. "Nobody should ask Ray Kelly to apologize — he's not going to and neither am I — for saving 5,600 lives," Bloomberg said recently. "I think it's fair to say that stop-question-and-frisk has been an essential part of the NYPD's work." Police on the streets said that the findings are consistent with the stops they make. "The amount of stops is contingent on the amount of foot traffic in the area," said one officer, who asked that his name not be used because he did not have permission to speak to the media. The officer explained that transit hubs, like Archer Avenue and Parsons Boulevard in Jamaica, tend to be hubs for crimes like larcenies and drug sales. "This area, if you look, you have buses stopping, you have a subway, you have black cabs, the LIRR. It's a very busy area," he said, noting that the area has also experienced several recent stabbings as well as a high-profile shooting late last year. "We find a lot of people come here from other boroughs and out of Jamaica who come here [to beg and commit transit crimes] because it's a busy area," he said. But while police have long said that officers target stops to areas with high crime, DNAinfo.com New York found the majority of stop-and-frisk hot spots — the intersections where the most stops were logged — are concentrated in neighborhoods with relatively low violent crime, and where gun violence is rare. In fact, just four guns were recovered from the top 25 hot spots, which logged a combined 19,567 stops in 2011, DNAinfo.com New York found. Other weapons, such as knives, were more common, but recovered in only about 3 percent of stops, the data show. "What we’re seeing is that the police department's claim that it goes where the crime is is not necessarily borne out. Its claim to be going after criminals is not borne out and its claim that this is about weapons and violence is not borne out," said Donna Lieberman, Executive Director of the New York Civil Liberties Union, one of the most vocal critics of the controversial stop-and-frisk policy, under which police stopped more than 700,000 people last year. While police maintain that the program is the most effective way to get deadly guns off the street, and credit it with driving down the city's murder rate down to what is on track to be a record low, criticism has been mounting over the impact of stopping so many people — especially when the vast majority are black and Latino youths. For young black men who frequently pass through the hot spots, the findings were no surprise. “It’s like an assault. You're having three or four guys you don’t know, in uniform, yelling at you,” said Mark Reed, 28, who is black and lives in West Harlem, said he was stopped outside the Port Authority in May, the fifth time he'd been stopped by cops, he said. Justin Baker, 22, a black student who lives in Rochdale, Queens, and frequently passes through Archer Avenue and Parsons Boulevard, estimated he'd been stopped and frisked at least 11 times, near the intersection. "Walking up the avenue, walking up the corner by my house... It's frustrating," he said. "It's crazy." Eugene O’Donnell, a professor at John Jay College of Criminal Justice who specializes in police procedures, said while the hot spots may not correlate with violent crime, it makes sense for many stop-and-frisks to take place in high-volume areas and transit hubs. “There’s some belief that it’s just a weapons-finding program, and that’s not it,” he said, explaining that police are often on the lookout for people connected to other crimes, including pickpocketing and larcenies involving high-value items such as cell phones. “The transit hubs are not hubs for murder usually. They’re not hubs for violent crime. But they do tend to be people in places where you’ve got people coming through from out of town, people carrying laptops and carrying iPhones … So you might have larcenies, nefarious characters hanging around doing criminal things that don’t inherently involve weapons,” he said. Another factor could also be the sheer number of cops stationed on patrol in areas like Times Square, noted Lieberman. But for the thousands of black men who’ve been subjected to the repeated stops, the impact can be wearying. “I have no privacy. I feel harassed. I feel threatened. I feel violated,” said Montana Lucci, 25, a black construction worker who lives in Harlem, who claimed he was stopped “every day” by police while passing through Penn Station, even though he’d never been charged with a crime. He said he felt the stops were racially motivated. “Look at the new 42nd Street,” he said, gesturing to the stream of tourists and business people walking by the station one recent evening near Times Square. “I guess they feel, at the end of the day, that they have to protect them more than protect us,” he said. Reed, who also lives in Harlem, agreed, and warned the situation was already threatening relations between communities and police. “Truthfully, it scares me to a point. I see police, and I’ll cross the street," said Reed, who admitted that he was arrested once during a stop for carrying a pocket knife, which he said he hadn’t realized was illegal. Reed said he's endured the embarrassment of stares of strangers passing by assuming he's a thug, and has also been screamed at hit several times by cops. “To the people who’ve never been frisked before, they don’t understand. You don’t know nothing ‘til you go through It,” he said. City Councilwoman Letitia James, who represents Central Brooklyn, and has long clashed with Kelly over stop-and-frisk, also warned about the impact on community relationships with police. “The public is a partner in the war on crime. And if you violate the rights of those who are in the position to help you, then the criminal justice system will break down,” said James, who said she became increasingly angry about the situation after her own 19-year-old nephew from Delaware was stopped and frisked on Atlantic Avenue while staying with her last summer in Clinton Hill. But not all young, black men oppose the policy, interviews revealed. Archie Melford, 21, a black student at John Jay College who lives in the Northeast Bronx, said he’d never been stopped or frisked by police, even though he frequently passes through Midtown, but wouldn't mind if he was. “If you have nothing on you, it shouldn’t be that big a problem,” said Melford. If he were stopped, “I would just get over it," he said.